Slate Insulations Ltd is your one-stop solution for insulating and heating your home - with cavity wall insulation, cavity wall insulation removal extraction, damp proofing, loft insulation, general building services and Solar PV. 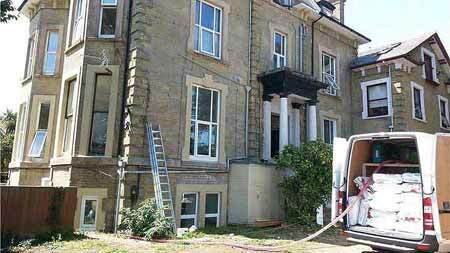 About 35 per cent of heat loss from UK homes takes place through external walls. Most homes built after 1920 have twin exterior walls with a narrow cavity between them. You can tell from the pattern of the brickwork or the thickness. Filling the space between the exterior and interior walls will reduce the heat loss and, therefore, energy consumption. If your house was built after about 1930, there's a good chance it has a cavity wall and, therefore, qualifies for a grant. You also have to live permanently in the property where the work will take place, and if you are a tenant, you must have the landlord's permission. Don't start work before you apply, you won't be eligible if you do. The installer will drill some small holes about one metre apart along your outside wall and then blow the insulation material into the cavity. The holes are then made good with a range of colour dies that match the joints in the brickwork. Slate Insulations will use a colour mix cement for a smooth or rough texture on rendered properties. You won't notice the difference. The Energy Companies Obligation is broken down into three components. The Carbon Emissions Obligation covers all UK homes. 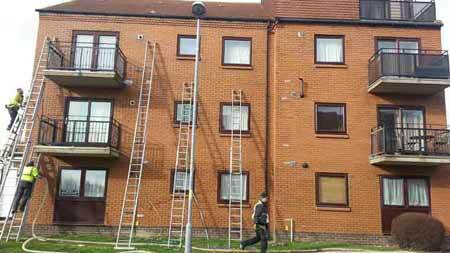 It is there to promote the free installing of energy saving measures such as loft and cavity wall insulation. The Carbon Saving Community Obligation targets low-income and deprived rural areas and encourages energy saving measures and the setting up of district heating systems. The Home Heat Cost Reduction Obligation aims to improve the ability of low-income areas and vulnerable homes to improve their heating. 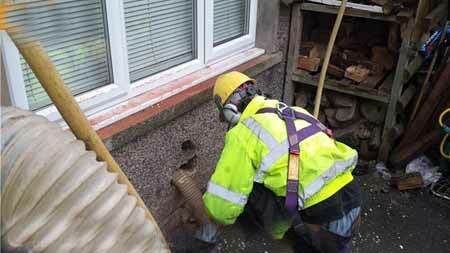 Help is available to get cavity wall insulation done. It's easy to carry out and saves you money in the long term. Book a survey today to see what Slate Insulations could do for you. These days, we're all concerned about saving energy because lower energy bills mean lower household bills that help the money go just that little bit further. Government schemes such as the Energy Companies Obligation (ECO) give households help with insulation and heating packages including cavity wall insulation. If your house is currently not insulated and it meets the government's criteria, you could qualify. 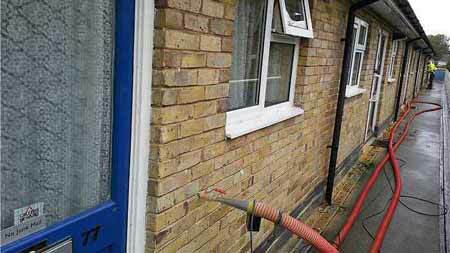 Read more about cavity wall insulation cost. The Energy Saving Trust estimates that an annual saving of £250 can be achieved on an average detached house in the UK. 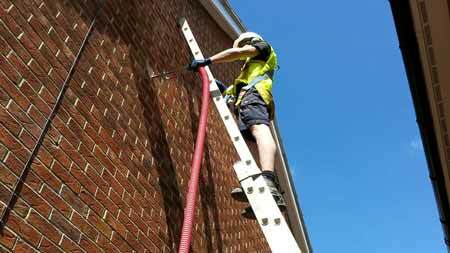 All of our cavity wall extraction teams are trained to the highest standards, and adhere to BBA guidelines. Cavity Wall Insulation. I was very happy with the work on the cavity walls. They were very tidy, polite and courteous, I would definitely use them again and recommend them to friends, family and other people. Loft Insulation Installed. Very professionally and efficiently carried out. There were a few issues that came up on the day that hadn't been accounted for but we were kept informed and given options of how to deal with these. The original work couldn't be carried out due to these unseen issues so the original price was reduced and a 'second best' option was carried out for free. 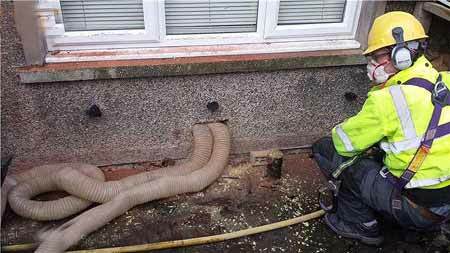 Cavity Wall Insulation. Carl couldn't have been more helpful - We needed this cavity wall insulation quickly and he delivered quickly! He arrived on site early, got the job done and sent over all certificates within hours. No chasing, no messing around - Will definitely be using his services again should I need them on other developments. Thank you again Carl. Please note that the Slate Group also carries out External Wall Insulation for properties with solid walls, the installation of Solar PV panels and General Building Services. Please follow the links to our sister websites.